Silicone wristbands, also called rubber bracelets, are colorful accessories that people of all ages like to wear around their wrists. Many young individuals match several of these wristbands with their clothes to enhance their overall look. But are wristbands just a fashion accessory? Several non-profit organizations around the world distribute personalized wristbands to make people aware of their causes. The colorful and cost-effective bracelets serve as an effective tool that people like to wear and make others aware of a campaign. In addition to raising awareness, custom silicone wristbands also make an effective accessory to generate funds for a cause. You can design them cheaply online and sell at high prices to collect money for your cause. In the modern competitive industry where businesses invest hugely to stay ahead in the competition, silicone rubber bracelets serve as a cost-effective tool to grab the attention of existing and potential customers. You can easily design and get wristbands online to promote your business in the real world. The wristbands will have your business name and logo of it engraved on them. You can distribute the accessories to your employees, clients, and even the public. Wearing the accessories, they will promote your business to people they meet. 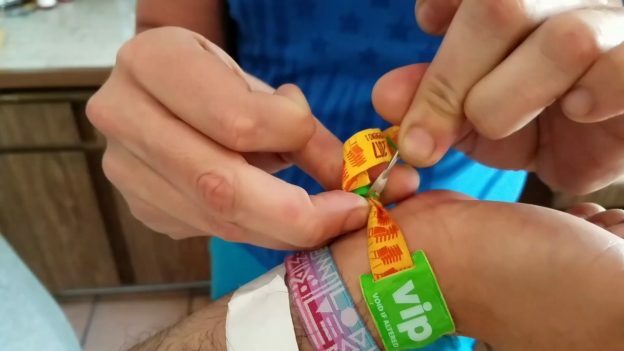 Wristbands aren’t equipped with a digital technology, but they are capable of adding an extra layer of security to your event. You can use custom silicone wristbands as entry tickets, crowd management tool, or free gifts to attendees. You can design plenty of them inexpensively and make them serve as an event management accessory. At Make Your Wristbands, you can customize various types of wristbands in any numbers. You can use the online store’s services to design wristbands as per your demand.